Sautee beef in a heavy large pot over medium heat until no longer pink, breaking up with spoon, drain the liquid. In a separate large skillet, heat the oil, add onions, garlics, peppers and jalapeño, sauté until the vegetables begin to soften. Add the vegetable to the pot with meat. Mix in spices, chili powder, chipotle chilies and chocolate. Pour in crushed tomatoes, kidney beans and beer. Bring chili to boil, stirring occasionally. Reduce heat and simmer 20 minutes, stirring often. Season with salt and pepper. 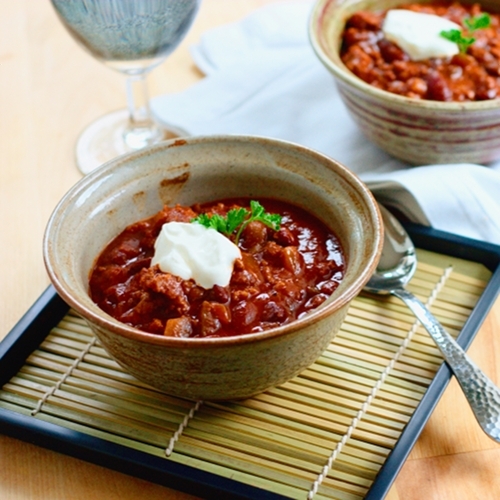 When chili is done, ladle into bowls, serve with sour cream, chopped onions and grated cheese. Note: Recipe is adapted from this website, modified (a little bit) by me.